It has been 10 years since the government changed drinking laws in England and Wales to allow pubs - theoretically at least - to serve alcohol 24 hours a day. But did anything actually change? When the Licensing Act came fully into force at midnight on 24 November 2005 it was called a new era. The idea that last orders at 11pm were to become a thing of the past had dominated headlines for months. It was reported that the act would lead to round-the-clock drinking and there were warnings that extended hours would cause chaos. 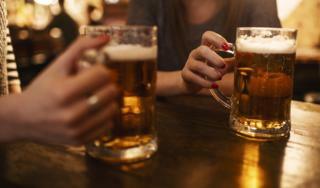 The Royal College of Physicians said it would increase alcohol consumption. Police chiefs complained that their forces would be stretched. One judge said that easy access to alcohol was breeding "urban savages". Supporters said the new law would give drinkers greater flexibility and help reduce alcohol-related crime. There would no longer be a rush to drink before 11pm and it would spell an end to crowds fighting after closing time. It would also help encourage a "continental cafe culture". "Bologna in Birmingham, Madrid in Manchester, why not?" said a parliamentary committee report in 2003. Others were less convinced. "I think the English - maybe the British - have been binge-drinkers since time immemorial," said Labour's former Health Secretary Frank Dobson at the time. "I don't think we're going to turn into Tuscany just because the hours have changed." The impact of flexible opening hours was not immediately obvious. "It's quite dead tonight," reported a BBC journalist in Carlisle on the evening the act was introduced. But what has happened since? It was thought the Licensing Act could have an effect on crime levels. The figures show that violent crime has been declining for decades in the UK. "To claim that that's related to the licensing act would be a bit misleading," says David Humphreys, an expert in social policy and intervention at Oxford University. In essence, violent crime was going down before the act came in. It has carried on going down over the past decade. As violent crime overall has been falling, so the subgroup of alcohol-related violent crime has also fallen. The proportions have remained steady. The latest figures show that in 53% of violent incidents, the victim thought their attacker had been drinking. We were promised more drunkenness, we were promised more alcohol being consumed. None of these things happened. The lack of a dramatic rise in alcohol-related crime has come as a surprise, says Humphreys. Countries such as New Zealand, Australia and Iceland, all saw increases in crime after introducing similar legislation. Humphreys conducted a study in Manchester after the new act was introduced. "We didn't find any notable effects on levels of violent crime," he says. "The conclusion we came to at the time was that the licensing act hasn't had as big an effect as people anticipated it would." Alcohol consumption has been falling since before the act was introduced. Figures from the British Beer and Pubs Association (BBPA) are based on alcohol sales and they suggest that consumption last year was 19% lower than at the recent peak in 2004. Binge drinking among adults has also been decreasing overall. More people in the UK are teetotal, with 21% of adults not drinking at all. It was 19% in 2005. Young people have been the drivers behind this, with a 40% rise in teetotal young adults from 2005 to 2013. But linking any of this to the Licensing Act is difficult. "You've got so many things that push levels of alcohol use around that I don't think you'd be able to separate out the effect of this policy change," says Simon Moore, a professor at Cardiff's University's violence and society research group. Some argue that the numbers show that some of the most dramatic predictions were wrong. "We were promised more crime and disorder," says Christopher Snowdon, from the Institute of Economic Affairs. "We were promised more drunkenness, we were promised more alcohol being consumed. None of these things happened." The government's own review of the policy in 2008 concluded that the act had not led to the widespread problems some people were worried about. But it added that there was no clear evidence of any positive benefits. The impact of the Licensing Act also seems to vary across England and Wales. Crime levels have worsened in some areas but got better in others. But while crime levels haven't really changed, the timing of crime has. Extended drinking hours does seem to have shifted violent crime to the early hours of the morning. "Things just went backwards," says Jon Foster, senior research and policy officer for the Institute of Alcohol Studies. "The amount of crime has been spread out over a longer period of time and that causes problems for the police," he adds. Several studies have looked at the effect on Accident and Emergency departments in hospitals. Some have reported a rise in alcohol-related admissions but in other areas the opposite has been seen. In 2014, there were an estimated 1,059,210 hospital admissions attributed to an alcohol-related problem - a rise from 493,760 in 2003-04. But some effects, such as liver disease or heart disease, can take years to develop, making it difficult to work out what factors are to blame. "We don't really have a good sense of the impact of the licensing act on health in general," says Humphreys. Part of the difficulty lies in the fact that - contrary to the headlines - actual 24-hour licences were extremely rare. Closing times have been extended by an average of less than 30 minutes, says Brigid Simmonds from the BBPA. Most pubs do not stay open until midnight even if they are allowed to. The impacts might have been clearer if it had been taken up by more venues. As it is, extended hours have contributed to the "normalisation" of alcohol, says Moore. But "overall not much has changed". Levels of alcohol-related crime and anti-social behaviour are still at unacceptable levels, according to the government. The cost of alcohol misuse is estimated to be around £21bn each year. Police officers have complained that 53% of their time is spent dealing with drink-related crime. And 50% of ambulance staff have said they have been injured when trying to deal with drink-related violence. The Local Government Association said as early as 2008 that the new act had "failed miserably" in changing the UK's drinking culture. Others argue it was never the main aim of the act. "It was just a side issue," says Snowdon. "It always was". There has been a change in the way people in the UK use certain venues. "We now serve a billion meals a year in pubs. It has much more of a family appeal," adds Simmonds. But the holy grail of the "continental cafe culture" is still proving elusive. "We're never going to have it," says Snowdon. Can demolished pubs come back from the dead? Have pub beer gardens become smoking gardens? Has Britain fallen out of love with lager? I would not have predicted this 10 years ago, but the extended opening times have enabled me to drink less, and more slowly, considerably increasing my enjoyment of it. I am more likely to go home at half past nine or 10o'clock, having had enough, than of old, when the 10.30 closing time made me order more to get as much as I could in before stop tap. I am of an age where clubs, open until 2am, no longer interest me, but am happy to benefit from the livelier and wider drinking opportunities my city centre provides at times more suited to my requirements earlier in the evening as a result of the presence of such clubs. The whole thing has become, for me, more relaxed and laid back, and much more pleasant as the streets no longer have a surplus of violent or otherwise offensive drunks at the time I choose to go home. I believe the key difference in the UK is the culture of buying rounds, which leads to peer pressure to keep up drink-for-drink with your friends. This simply does not happen in Germany, for example, where in my experience groups of friends in a bar typically have a tab which the serving staff settle up with you individually at the end of the visit. The only change is that at weekends I get served in the pub until midnight instead of 23:00. From what I have seen, the law has done little to change the behaviour of most pub goers beyond the extra hour at the weekend, and many don't even take advantage of that and stick to old habits. There is little doubt that a major consequence of the Act is that people tend to go out later and stay out later. I act for licensees in this sector some of who are unreasonably hampered in developing their estates by councils' rigid interpretation of their Cumulative Impact Policies designed to address issues of anti-social behaviour. As I have long suspected, and as your research suggests, this may well be an unfair situation. Surely the biggest factor influence on the lack of expected crime and disorder spikes has been the performance of the economy over the same time period. Working customers have less disposable income to spend in pubs and clubs, scaling back on visits. Also the disposable income allocated to drink has been diverted to off sales, which are far cheaper as these outlets carry less proportional overhead. Finally a lack of revenue and profitability has led to a lack of reinvestment in established pubs, making them less desirable to visit.